On a 15 acre / 6 ha. 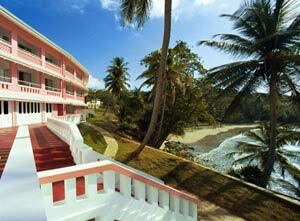 ocean front property, this historic hotel has been a holiday retreat for the Royals and film stars since 1940. Blue Haven has been extensively renovated. This romantic property combines the restored tradition of the old days with modern facilities. 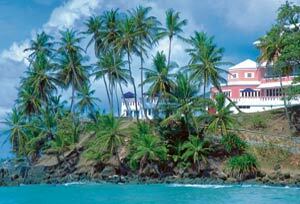 Blue Haven is located along the southern shore of Tobago, overlooking the beach where Robinson Crusoe was stranded. All 55 rooms offer breathtaking ocean views. All superior and deluxe rooms including 10 suites are designed with elegance for your maximum comfort. 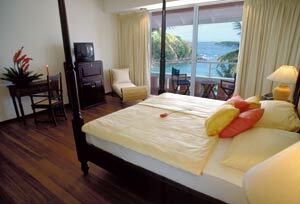 All rooms offer private balconies with ocean view. The elegant conference room is suitable for meetings accommodating a maximum of 60 to 80 persons. 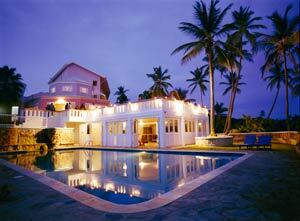 Perfectly in tone with the character of the hotel the main restaurant is part of a colonial style villa. The lounge / terrace bar is the perfect spot to lime, as you enjoy the ocean breeze, while the beach bar offers a bar-b-cue lunch and a variety of cocktails. Recreation facilities include a large fresh water swimming pool overlooking the ocean, a tennis court and a gym with a massage room. Children can have fun in the safe and well-kept playground. Please contact us about rates and availability.